We are a trustworthy manufacturer of a wide array of Soil Infiltrometer, an instrument that is used for determination of infiltration rate of water into the soil. This rate is determined as the amount of water per surface unit and time unit that penetrates the soils. The rate is measured on DARCY law. In the inner ring, the measurement takes place through which water runs vertically. 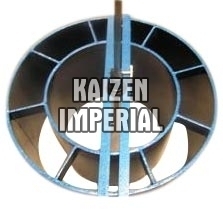 The instrument consists of two rings, driving plate, for inner and outer rings. The outer rings are used for preventing divergent flow in layered soils.